James and Lois Archer pose with current Archer Presidential Scholars. 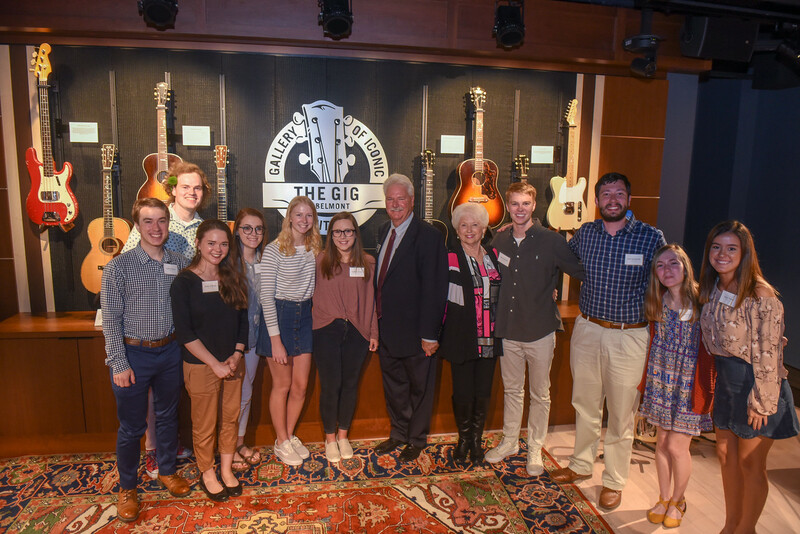 James Archer, president/CEO of Nashville-based MV2 Entertainment, and his wife Lois announced today the creation of a $10 million endowment at Belmont University, resulting in a renaming of the University’s prestigious Presidential Scholars program. The Archers’ gift recognizes Belmont’s longstanding institutional commitment to being a values-based organization which includes a pledge to ongoing excellence and values-based leadership development within the University community. The Presidential Scholarship, now to be known as the Archer Presidential Scholarship, is Belmont’s most competitive scholarship, providing full tuition, room, board, books and fees for four academic years (eight semesters) of continuous study. Selection criteria include a review of academic and leadership accomplishments along with a minimum composite score of 30 on the ACT or SAT score of 1390. Recipients are chosen with values and leadership in mind, and they apply those skills throughout their experience at Belmont. The Archer Scholars meet often during their time on campus to hear from a variety of speakers, and each recipient is paired for four years with a mentor from Belmont’s Senior Leadership team. As announced with the university’s We Believe Campaign unveiling, Belmont is partnering with its supporters to leverage their investments in the institution’s future. The University will match endowment contributions to select institutional priorities, doubling the impact of each donor’s commitment. The Archers $5 million gift is being matched by Belmont to create a $10 million endowed fund to support the Archer Presidential Scholars program and ongoing values-based leadership development across the University campus. The James B. and Lois R. Archer Charitable Foundation also serves as the presenting sponsor for The Gallery of Iconic Guitars (The GIG), providing support to undergird the museum’s operation, special projects and educational programming. Beyond his work at MV2 Entertainment, Archer has more than 40 years of experience in the oil and gas business and serves as CEO and president of Texas-based oil and gas operator KJ Energy. Recognized as a leader in technology for gas enhancement, Archer founded Multi-Chem and under his leadership grew his company into the third largest specialty production chemical company globally and successfully sold to Halliburton in 2011. A long time music fan, Archer was convinced he could make a difference in music the same way he had in oil, by incorporating values and ethics into the product and the process of doing business. True to that philosophy, MV2 Entertainment was founded in 2015 with the moniker standing for “Mission Vision Values,” shorthand for doing the right thing.